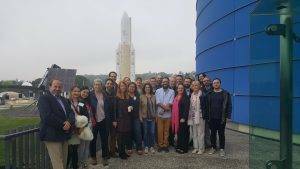 A partners’ assembly of the international OSOS Project, led in Israel by the Israel Sci-Tech Network’s R&D Center in collaboration with the Bloomfield Science Museum, Jerusalem, was held recently in France. Representatives of the 12 participating countries gathered in the Musée de l’Air et de l’Espace near Toulouse, to survey the progress of schools currently taking part in the project, ahead of the incorporation of further schools. The project’s ultimate goal is to reach 1,000 Open Schools across Europe, all realizing its vision of STEM learning which involves the wider community. During the meeting, the activities of the participating Israeli schools were presented by the Israeli representatives, Mr. Yair Ben-Horin from the Israel Sci-Tech Network’s R&D Center, and Mr. Omer Gaist from the Bloomfield Science Museum, Jerusalem. In Israel, where the project has entered its second year, there are currently 32 schools participating in it, hailing from various regions and socio-economic sectors: Kiryat Motzkin, Haifa, Kiryat Haim, Acre, Sakhnin, Kiryat Tivon, Afula, Ra’anana, Gedera, Kiryat Malachi, and Jerusalem. Preparations for the project’s expansion to include additional schools are currently underway.